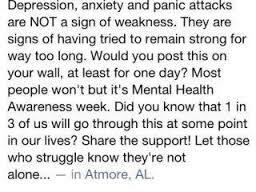 I read this little message on facebook yesterday, saying that “anxiety and depression isn’t a weakness” and I couldn’t agree more. If people had no emotions to guide them, we’d probably be enjoying someone insulting us. I would hate to imagine what kind of disadvantage we’d be in, if that happened all the time. When I first had anxiety, I didn’t even know what it was. I know I would’ve paid anything to have the knowledge I have today, all the things I’ve learned about how to cope with it has some ways, saved my life. Anxiety and depression shouldn’t be seen as a weakness, because they’re all just human emotions. If we don’t see happiness as a sign of embarrassment, why should we see the opposite? If we don’t feel ashamed when we laugh, then why should we when why cry? I think that sometimes, all we have to do is look at this logically. Anxiety and depression are magnified versions of fear and sadness, which are common emotions people experience. Unfortunately, our bodies aren’t perfect in handling these things, because many people seem to get anxiety and depression and feel that they can’t control it. That is not a weakness. Problems with our minds is really like problems physically. I doubt if you cold the flu or a cold, people wouldn’t call you weak. Why should getting anxiety or depression be any different? I think the reason why problems with the mind seem so much of a personal problem than physical, because we know that our minds are something we can control (most of the time). But if we do think about it, there are many emotions we can’t control. Can you not be happy when your dreams come true? Can you not feel sad when someone close to you die? You can run through this logic with them! Firstly, I would try and define the purpose of emotions and this is one of my strongest philosophies, is that all emotions are there to help us live better, whether we realise it or not, and whether it works 100% or not. That’s what their purpose is, if we can feel a sharp pain when kick the table accidentally (I’ve done that plenty of times and hell, does it hurt), then why wouldn’t we feel a different type of pain, if we lost something, or were treated badly? We were given these emotions so we REALISE what’s done to us is bad, and that we should try and stop it so we have a better chance to live. This is the purpose! Emotions actually make you stronger, not weaker! It’s interesting that when I started writing all about anxiety, how many people came to read it, even people I knew. Perhaps many of you can even relate, but you never choose to tell anyone because you feel that you’re weak for having it. Let me tell you that you are not! This is all normal, if we didn’t have fear, we probably wouldn’t even be scared if a spider crawled on our faces and poisoned us. If we didn’t feel sad when bad things happen, we’d probably just let them happen all the time and not even realise it’s bad. See your emotions as something that’s trying to help you, and something that doesn’t always get it right, not as a sign of weakness.